Steve Jobs once said, “I want to put a ding in the universe.” Now M.I.C. Gadget (their name stands for “Made In China”) has done it for him, with a delightfully, disturbingly detailed action figure of the Big Apple Boy himself. The hand-made figurine, available at the M.I.C. website priced at $79.90 including shipping, goes beyond mere caricature to the point where one suspects the designers of pathological Jobs obsession. The figure is clothed in Stevie Wonder's fave everyday duds such as Levi's 502 blue jeans, trademark black turtleneck and New Balance sneakers. The jeans especially are amazing – perfectly faded and intricately creased! 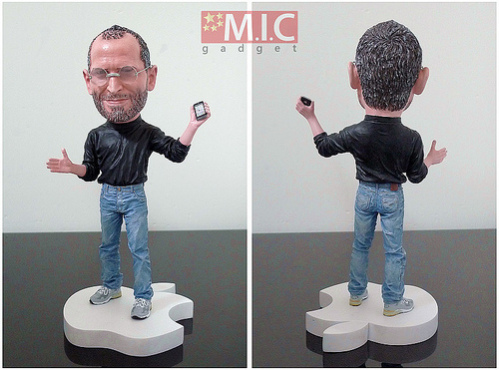 It gets better: the Steve Jobs figurine stands on a white Apple logo podium and grips an iPhone 4 in his left hand. He wears a pair of frameless specs that are removable, or at least can be slid up to his forehead for that classic geek casual look. 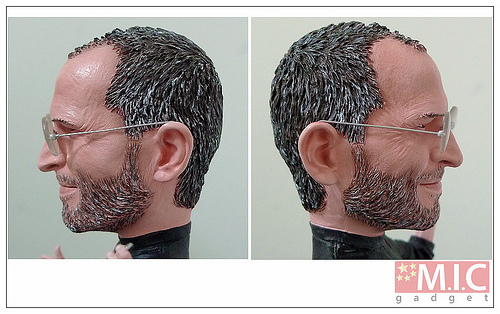 Moving in close, one marvels at the detailing on the Steve Jobs figure's face, hair and stubbly beard. The crow's feet at the corners of his eyes are expertly rendered in loving detail, as are the gray flecks in Jobs Jr.'s hair and beard. 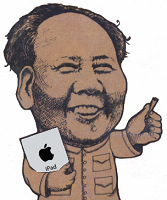 One wonders what Jobs himself, and avowed anti-piracy advocate, thinks of this striking – and most likely unauthorized – likeness. 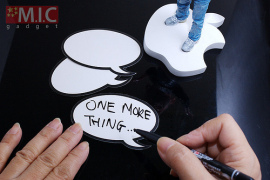 One more thing... as if the Steve Jobs action figure itself wasn't awesome enough,. M.I.C. saw fit to assemble an optional accessories kit set that pushes this design into action figure legend territory. 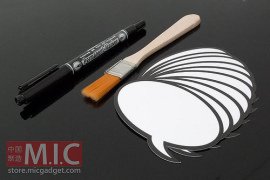 The set, which includes a marker, 10 blank DIY speech bubble cards and – wait for it - a brush you can use to dust off your figurine, only costs $2.99 extra. As you can imagine, this amazingly realistic Steve Jobs action figure has exploded onto the collectible figurine scene and has found wide appeals among geeks, dweebs, Apple fanboys and varied combos of all of the above. M.I.C. only produced 300 figurines as part of an announced Limited Edition and they're already sold out! * UPDATE! November 24th: In a not-unexpected development, Apple Computer's lawyer action figures have put the kibosh on M.I.C. 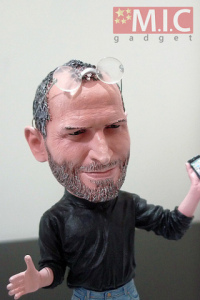 Gadgets' Steve Jobs action figure. According to an email received by M.I.C., "Unauthorized use of a person’s name and/or likeness constitutes a violation of California Civil Code Section 3344, which prohibits the use of any person’s name, photograph or likeness in a product without that person’s prior consent…" The sound you just heard? That was millions of Apple fanboy voices, suddenly crying out in disappointment.